Sales dollars improved 8% in July to $124,260,240 from June’s $114,883,928. This is 20% above July last year at $103,293,794. (Sect A p.2). A increase in July sales is somewhat unusual and may be a encouraging sign of a continuing improving market. The 12 month moving average line of sales has continued to point up steadily for three years now. Inventories are steadily trending down. On a unit basis, sales of all houses were up 1% at 495 this month vs. last month at 489, which is up 29% from last year’s 383. In spite of the substantially improved sales climate, it is important to point out that the inventories of homes over $300,000 while improving from really bad levels, remain at over a 12 month supply. Used Home sales improved 5% to 451 this month vs. 428 last month, which is up 18% from last year’s 383 (Sect A p.18). New Home sales were 44 this month vs 61 last month compared with 29 last year. Increasing sales of New Homes is indicative of a recovering market. New listings for New homes decreased to 74 from 97 in June. Used homes New listings increased to 784 from 776 in June with net inventory down. The absolute number of Used Active homes on the market, which had a slight peak mid-summer of ‘09, has once again been improving. In July, there were 3,597 Active Used homes, a reduction from 3,910 in June. The New home market, which peaked in July 2006 at 2,144 Active, now sits at 363. The Absorption rate for New homes was 9 months of inventory for July vs. 10 in June. The Absorption rate for Used homes was 10 months of inventory for July vs. 11 in June. Over the last four years the drop in months of inventory for Used homes has been steady and impressive from 25 months plus in July 2008 to 10 months this July. As I observe above though, the inventory for homes remains high. Average sales price for all homes have been improving modestly for the past year. For New units, prices decreased to $218,380 from $258,086 last month. (Sect A p.14). Average Used home prices increased to $254,216 from $231,637 in June. The price trend is up for the year. Average Days On Market for New Sold properties in July was 186 this month vs. 90 last month. Days On Market for Used was 154 this month vs. 193 last month. We see improvement in the second home market, which is needed for the coastal area to gain strength. While there is still a lot of inventory particularly in the upper price ranges, sales are continuing to improve. I think the situation on the coast has turned quite positive. This entry was posted in Absorption, Alabama, Alabama Coast, Baldwin, Monthly comments, real estate and tagged Alabama, Alabama Coast, August, Baldwin County Alabama, MLS, Real estate pricing, Residential Real Estate on September 18, 2013 by Tom Brander. June sales improved by 5% to $161,771,359 vs. May at $154,298,298. This was up 7% from last year’s $150,559,136. The twelve month moving average line on the total dollar sales chart is heading up. It is good to see robust sales in the peak selling month. Total unit sales improved 2% to 949 in June vs. 928 in May, an increase of 21. This was 6% better than last year at 892. Our projections for ACRE and Brander Real Estate for 2013 called for 995 sales in June with actual results 5% under that, and year to date volume is 3% lower than our projection. See here http://goo.gl/nytW8 for an article sumarizing the projections. Here is the spreadsheet with month by month projections by area http://goo.gl/GEYWa (see the tabs on the bottom). New sales increased to 160 this month vs. 121 last month, up 39. Used sales decreased to 789 this month vs. 807 last month, off 18 (Sect E p.3). Used inventory levels remain high this month at 12 months (see the chart Sect C p.1), with the situation particularly challenged in the higher price ranges. Used homes over $400,000 have more than two years of inventory. New home absorption is 9 months of inventory overall with last month at 11 months, and this has been climbing)(E-1). The New Home inventory level in the $300,000-$500,000 is approximately 5-6 months. (Not bad!). There continue to be a large number ofhousing permits issued in Huntsville city given the market conditions. For May there were 113, up from 83 in April (chart on the web site). Total Active listings decreased this month to 9,100 compared to last month’s 9,563, and below last year at this time at 9,049, with the reduction exaggerated due to month-end expirations. (Sect A p.4 and Sect E p.3). The reduction in inventory is a positive thing. The inventory reduction has been good for the last 9 months; we are however seeing signs of a summer increase. Active New listings decreased from 1,619 last month to 1,365 in June, down 254. (Sect E p.3). Active Used listings decreased from 7,944 last month to 7,735 this month, down 209 and slightly below last year’s amount at this time of 7,795. (Sect E p.3). Average Days on Market for Sold New homes was 148 vs. 160 days last month, with Used at 145 in June compared with 166 in May (Sect A p.18). The average price line for Used homes is going up. New home average prices seems to be showing positive direction as well. This entry was posted in Absorption, Alabama Real Estate Confidence Index, Building Permit, Forecast, Huntsville, Inventory, Monthly comments, North Alabama, real estate, sales forecast, sales projections and tagged Absorption, Alabama, Days on market, Inventory, June, MLS, North Alabama, real estate, Sales on July 22, 2013 by Tom Brander. Sales in April declined 5% to $153,269,290 from March’s $161,546,070 down 31% from last April’s $220,966,609. April historically shows substantial improvement over March. This month to month decline is very disappointing. We are seeing a very slow ramp up in spring sales. The tax credits last year will continue to make comparisons problematic. Total unit sales were down 7% to 982 in April from 1,056 in March, a decrease of 74. This is a 29% reduction from April 2010 at 1,387. New sales declined 15% to 96 homes this month from 113 in March, a decrease of 17 units. (For what it is worth, this is less than half of last year’s new sales in April which were 202). Used sales declined 6% to 886 homes in April from 943 last month, a decrease of 57 (Sect E p.3). This month Total Inventory is somewhat lower at 12,366 vs. 13,691 last year. Active New listings decreased to 1,044 in April from 1,266 in March, a decline of 222 units (Sect E p.3). Housing Permits showed a slight increase in Jefferson County from 51 in February to 62 in March..
Absorption rate for New homes at a 8 months supply and a reduced sales pace, is about the same as last year at this time (Sect E p.3). While the situation is still distressed, New homes seem to be selling, and supply is keeping in balance. Strangely, under $100,000 New homes are at 16 months of sales, while those priced from $100,000-$400,000 range from 6 to 9 months of inventory, a pretty “normal” situation in such abnormal times.. (Sect C p.1 compare to last month and Sect E p.3.) New house inventories in higher price ranges (above $500,000) remain (with a notable exception in the $800,000 to $900,000 range at 8 months) excessive at over a year. Absorption for Used homes in April 2011 shows 11,322 Used Active listings as a lower number than 12,246 last year, (Sect E p.3) which is still 14 months of supply, a bit worse than 13 last year at this time due to reduced sales levels (Sect E p.3). There are some signs of increased listing activity, and a trend to higher inventories as spring approaches. Birmingham area Average Days on Market for New houses was 221 compared to last month at 223. The Used homes DOM was 142 in April, compared with 139 last month (Sect A p.18). An interesting side note is that the DOM for used homes under $600,000 is 180 days or less which indicates that well priced homes are moving in less than 6 months. The high months of inventory indicates that sellers, including bank owners, may still be holding out too much for higher prices . Average sales price for Sold New homes increased to $207,022 from $199,758 last month (Sect A p2). Average sales prices for Sold Used homes increased to $150,560 from $147,374 last month and decreased from $152,211 last year(Sect A p2). The twelve month moving average price line for Used homes has been quite steady since mid 2009. New homes prices continue to drift downward (Sect A p2). This entry was posted in Absorption, Birmingham, Building Permit, Inventory, Jefferson County, MLS, Monthly comments, real estate and tagged Absorption, Birmingham Alabama, building permits, Housing Statistics, MLS, Monthly comments, New home sales on May 17, 2011 by Tom Brander. Alabama Coastal Real Estate begins to look up? Last year at this time I began to discuss how I though that things were improving in Alabama coastal real estate. The following month the oil spill happened. This year I am seeing the same positive pattern emerge, so hopefully with no disasters we should see a decent market. This month dollar sales improved a reasonable 17% to $84,121,723 from March’s $72,067,530. This is 3% below April last year at $87,171,023 and is encouraging (Sect A p.2). The 12 month moving average line of sales is pretty flat. The chart in Section A p.18 has been showing substantial inventory reduction for eleven months, but not so much from sales as people not listing properties. The reduction in Active listings will probably help the market somewhat. Inventories remain very high. Used inventory is now below 4,000, a full 2,000 below August 2008, but the sales level has also shrunk dramatically. The number of Active listings continues to drop, which is positive (more below). The 12 month moving average line of unit sales for Used homes had a pronounced upward slope through seven months ago. But with the spill, it had been showing a slight downward trend. For the last several months, the line has begun to point up. On a unit basis, sales of all houses improved, up 11% to 388 this month vs. 351 last month, which is 10% off from last year’s 429. Used house unit sales were up 14% to 363 from 318 last month. New home unit sales declined to 25 from 33 last month (Sect A p.18). The low number of sales of New homes reflects the intense competition from existing, and an extended slowdown of new construction. New listings for New homes decreased to 32 from 47 in March. Used houses New listings remained at 766 this month (net inventory was still down). We have not seen a dramatic increase in spring listings yet. The absolute number of Used Active homes on the market, which had a slight peak mid-summer of ‘09, has once again been improving. In April, there were 3,968 Active Used homes, a 8% reduction from 4,333 in March. The New home market, which peaked in April 2006 at 2,144 Active, now sits at 333. The Absorption rate for New homes was 12 months of inventory for April vs. 12 in March. The Absorption rate for Used homes was 14 months of inventory for April vs. 15 in March. (Sect A p.17). Average sales price for all homes has been quite stable for the past year. For New units, prices increased to $223,203 from $217,950 last month. (Sect A p.14). Average Used home prices increased to $202,373 from $182,234 in March. Over the last four months Six Used homes in the over $900,000 price range sold each month, and eight this month, which is a notable positive change. It seems that word is out though, and there were 22 new listings in this price range. Average Days On Market for New Sold properties in April was 342 this month vs. 240 last month. Days On Market for Used was 198 this month vs. 173 last month. I regard the increase in days on market as a good sign indicating that older inventory is moving. This entry was posted in Absorption, Alabama Coast, Baldwin, Home values, Inventory, MLS, Monthly comments, Oil Spill and tagged Alabama Coast, Baldwin County, Days on market, Housing Statistics, MLS, Monthly comments, Residential Real Estate on May 17, 2011 by Tom Brander. Sales in March improved 36% to $154,622,296 from February’s $113,898,354, down 17% from last March’s $185,484,567. March historically shows substantial improvement over February. This year the month to month improvement is lackluster compared to prior years. It is disappointing to see sales below last year. We are seeing a slower ramp up in spring sales without the distortions caused by the tax credits last year. Total unit sales were up 32% to 1,000 in March from 759 in February, an increase of 241. This is a 19% reduction from March 2010 at 1,242. New sales improved 24% to 99 homes this month from 80 in February, an increase of 19 units. Used sales improved 33% to 901 homes in March from 679 last month, an increase of 222 (Sect E p.3). This month total inventory is somewhat lower at 12,379 vs. 13,626 last year. Active New listings decreased to 1,070 in March from 1,268 in February, a decline of 198 units (Sect E p.3). Housing permits showed a decrease in Jefferson County from 67 in January to 51 in February..
Absorption rate for New homes at a 8 months supply and a reduced sales pace, is about the same as last year at this time (Sect E p.3). While the situation is still distressed, New homes seem to be selling, and supply is keeping in balance. Strangely, under $100,000 New homes are at 15 months of sales, while those priced from $200,000-$500,000 range from 5 to 8 months of inventory, a pretty “normal” situation in such abnormal times.. (Sect C p.1 compare to last month and Sect E p.3.) New house inventories in higher price ranges (above $500,000) remain excessive at over a year. Absorption for Used homes in March 2011 shows 11,309 Used Active listings as a lower number than 13,626 last year, (Sect E p.3) which is still 13 months of supply, the same as last year at this time due to reduced sales levels (Sect E p.3). There are some signs of increasing listing activity, and a trend to higher inventories, as spring approaches. Birmingham area Average Days on Market for New houses was 223 compared to last month at 213. The Used homes DOM was 139 in March, compared with 143 last month (Sect A p.18). An interesting side note is that the DOM for used homes under $700,000 is 180 days or less which indicates that well priced homes are moving in less than 6 months. The high months of inventory indicates that sellers, including bank owners, may still be holding out too much for higher prices . Average sales price for Sold New homes decreased to $200,800 from $209,800 last month (Sect A p2). Average sales prices for Sold Used homes increased to $149,548 from $143,049 last month and $138,428 last year(Sect A p2). The twelve month moving average price line for Used homes has been quite steady since mid 2009. New homes prices continue to drift downward. (Sect A p2). This entry was posted in Birmingham, Building Permit, Construction, Home values, Inventory, Monthly comments and tagged Birmingham, building permits, Days on market, Housing Statistics, Inventory, MLS, Monthly comments, Residential Real Estate on April 12, 2011 by Tom Brander. March sales increased 13% to $105,233,577 vs. February at $93,078,986. This was 13% below last year of $120,903,000. Keep in mind that last year we were seeing the impact of the tax credit. The month to month increase was somewhat lackluster given the normally strong seasonal trend.The twelve month moving average line on the total dollar sales chart is pretty flat, which is an encouraging sign for the future. Total unit sales increased from 581 in February to 663 in March, an increase of 82. New sales decreased from 129 homes last month to 125 this month, a decrease of 4. Used sales increased from 452 homes last month to 538 this month, an increase of 86 (Sect E p.3). Used inventory levels remain high at 14 months with the situation particularly challenged in the higher price ranges. Used homes over $100,000 are still over a year of inventory. Prices continue to be pressured, although average prices seem to have stabilized somewhat. New homes are at 8 months of inventory overall, and homes priced under $100,000, are at 17 months of inventory. Greater than $500,000 are about two year’s worth of inventory. In the $100,000-$500,000 range inventories are fairly normal, ranging from 5-8 months(E-1). 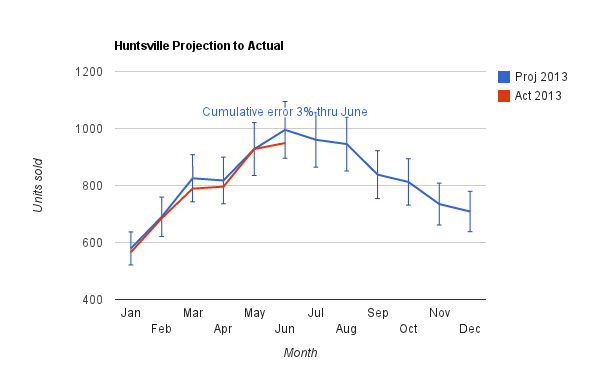 There continue to be a large number of housing permits issued in Huntsville city, given the market conditions. February showed 86 vs. 65 in January. Total Active listings decreased by 3% this month to 8,818 compared to last month’s 9,110, which is 1% below than last year at this time, at 8,896 (Sect A p.4 and Sect E p.3). New Homes New Listings are more than 2 times New home Sales. (Sect B p.1). Active New listings decreased from 1,465 last month to 1,260 in March, down 205. (Sect E p.3). Active Used listings decreased from 7,646 last month to 7,558 this month, down 88. This is below last year’s amount at this time of 7,479. (Sect E p.3). We have not yet seen an expected surge in spring listings. Absorption for New homes was 8 months of inventory in March. This is better than 9 months in February and 9 months last year at this time (Sect E p.8). Absorption for Used homes was 14 months of inventory in March, which is even with last month at 13, and last year at 14 months (Sect E p.8). Average Days on Market for Sold New homes was 183 vs. 200 days last month, with Used at 164 in March compared with 177 in February (Sect A p.18). The fact that the Days on Market is below 6 months while the inventory numbers are higher indicates that well priced homes will sell. Sellers, including bank owners, are having a hard time adjusting to the new price reality which contributes to the inventory build-up. The Average price lines have had a generally upwards slope for a while now but that is mostly due to a changing mix of home sales with some more higher priced homes beginning to move as a proportion of the total market; prices for individual properties remain under pressure. Please see the next page for an important error explanation which impacted reporting by area, and some inventory levels over the last few months. This entry was posted in Building Permit, Home values, Huntsville, MLS, North Alabama, real estate and tagged Days on market, Housing Statistics, Huntsville, MLS, Monthly comments, North Alabama on April 12, 2011 by Tom Brander. Sales in February improved 3% to $102,916,457 from January’s $99,560,676, down 12% from last February’s $117,411,643. This is a slight improvement over last month. February usually shows some improvement over January. This year the month to month improvement is lackluster. Total unit sales were up 3% to 684 in February from 666 in January, an increase of 18. This is a 17% reduction from February 2010 at 826. New sales declined 16% to 69 homes this month from 82 in January, a decrease of 13 units. Used sales improved 5% to 615 homes in February from 584 last month, an increase of 31 (Sect E p.3). This month total inventory is somewhat lower at 12,023 vs. 13,015 last year. Active New listings decreased to 1,100 in February from 1,238 in January, a decline of 138 units (Sect E p.3). Housing permits Showed an increase in Jefferson County from 35 in December to 67 in January..
Absorption rate for New homes at a 7 months supply and a reduced sales pace, is better than the 8 months last year at this time (Sect E p.3). While the situation is still distressed, New homes seem to be selling, and supply is keeping in balance. Strangely, under $100,000 New homes are at 16 months of sales, while those priced from $200,000-$500,000 range from 5 to 7 months of inventory, a pretty “normal” situation in such abnormal times.. (Sect C p.1 compare to last month and Sect E p.3.) New house inventories in higher price ranges (above $500,000) remain excessive at over a year. Absorption for Used homes in February 2010 shows 10,923 Used Active listings (Sect E p.3) which is 12 months of supply, the same as last year at this time (Sect E p.3). Since May 2010 the number of Used Active listings has dropped by almost 1,700! Unfortunately, the drop has been due more to cancellations than sales, but it is still positive news. It is also important to note that much of the decline is seasonal as sellers wait out the slow winter months. There are some signs of increasing listing activity as spring approaches. Birmingham area Average Days on Market for New houses was 212 compared to last month at 228. The Used homes DOM was 143 in February, compared with 152 last month (Sect A p.18). Average sales price for Sold New homes increased to $206,300 from $202,354 last month (Sect A p2). Average sales prices for Sold Used homes increased to $144,198 from $142,068 last month (Sect A p2). The twelve month moving average price line for Used homes has been quite steady over the last year or so, but New homes prices continue to drift downward. (Sect A p2). The reports this month are a bit earlier than usual due to the way the dates fall. Also, I have to attend a conference next week-end. Since I make it a point to get the report out the Monday prior to the 15th and this month the 15th falls on a Tuesday, we are a little early this month which means there will be a modest upwards adjustment of sales as late ones are reported next month. This entry was posted in Birmingham, Building Permit, Construction, Home values, Inventory, Jefferson County, MLS, Monthly comments, real estate and tagged Absorption, Birmingham, building permits, MLS, Monthly comments, real estate on March 8, 2011 by Tom Brander.